Mediafire runs using adverts, so the download button may NOT be obvious to you if your new to file sharing web sites.. this is why i have added the FILE SIZE next to each screen saver, mediafire has many download buttons.. only ONE has that file size on it.. and that's the file you want... be careful.. 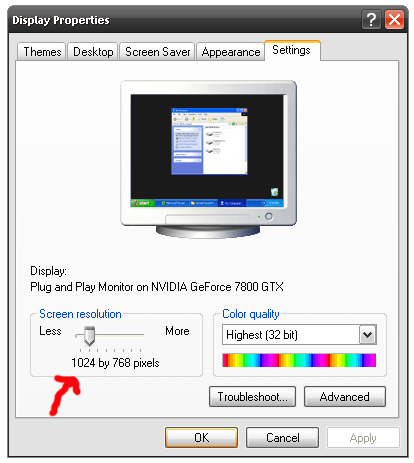 Your own computer (if infected, or has remaining remnants of a virus that was never fully removed in the past) can use parts of the SCR file packing compression code, and part of the RSS feed code is sometimes detected as "PUA.Packed.PECompact-1" this is a false positive and is only the code used that makes the "SCR Dialog Displays" options pop up onto your screen and display the window, also for the Preview image in the windows desk top scr settings box. This way 3rd party stuff infecting your machine can not use any part of the scr for its own gain.. Remember these are home made, an SWF coded into an SCR, so their is no digital signature, no safe list and you can NOT add an SCR to an exception list because they can be infected by other means.. Again this is why i do not want them packaged with themes.. there's more to it than "your theme being clean" it's how you pack it, how the site keeps it... i have picked the best method of release (been at this stuff since 2001 online) and 1999 offline.. Anyways here's the shot from Jotties page.. Also read the TECH Warnings below to avoid colour spots and dead pixels.. 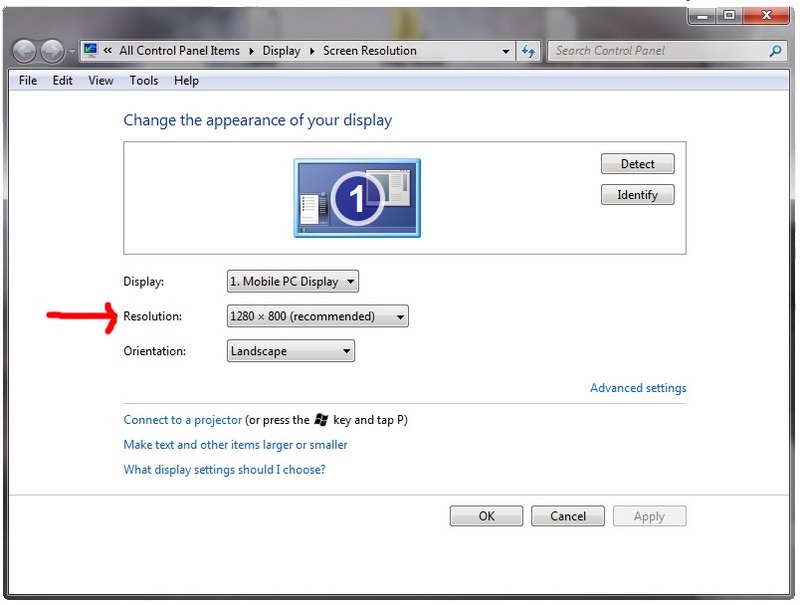 Using screen savers that have none animated sections such as wide-screen boarders, or black lines down either side of your monitor/display is not healthy for it. It's ok to look at and play about with, but a screen saver being active for hours at a time MUST be fully refreshing every pixel on your screen or it'll damage your screen over time, damage even more so than not using a screen saver... because 2 lines (top and bottom) or even (left and right) will end up showing colours differently than the rest of your screen. Q) I have downloaded one and i have black boarders on the screen, what size do i need? 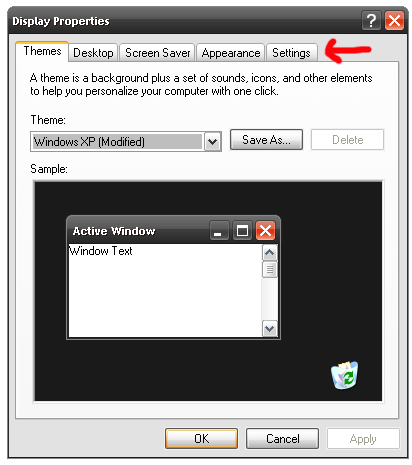 On Windows XP Systems you can "Right Click" on your "Desk Top" and select "Properties" and this box will pop up.... Click on the "Settings Tab"
Q) What about duel displays where one is bigger than the other? Q) When i run the screen saver the screen is a blue background with faded blue borders? A) Place the scr file into either your "system32" folder, or directly on your "desk top"
It will not run from the root drive, or from inside a folder on the desk top or any other folder for that matter, due to windows permissions over SCR files. Q) What are these and How are they made? 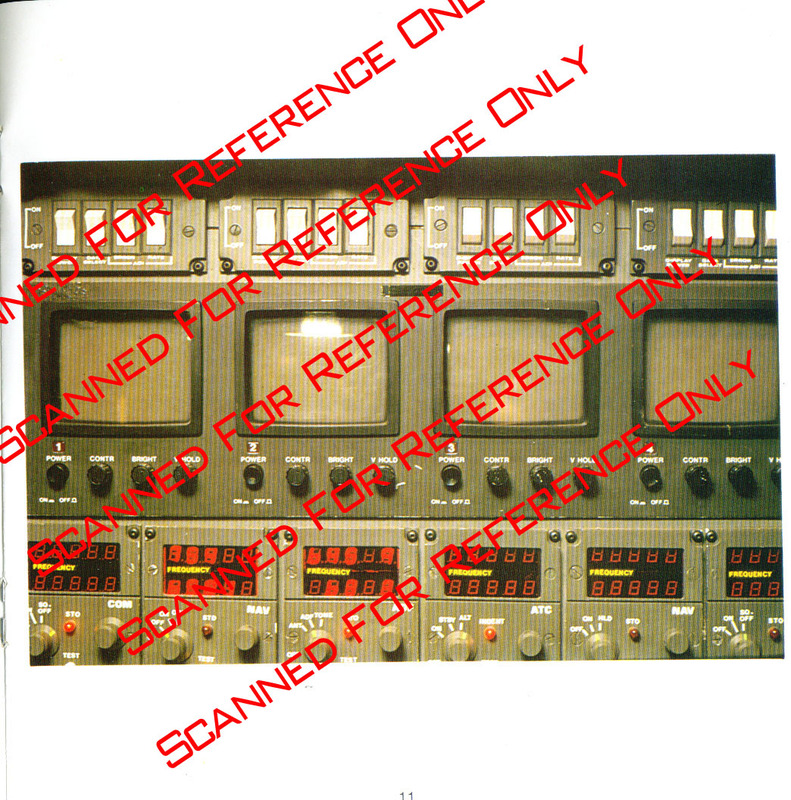 the SWF was compiled with "Flash Image Builder" and the compiled into an scr using "Alexis Screen Saver Producer Corporate Edition"
Q) What is the scr and windows requirements? 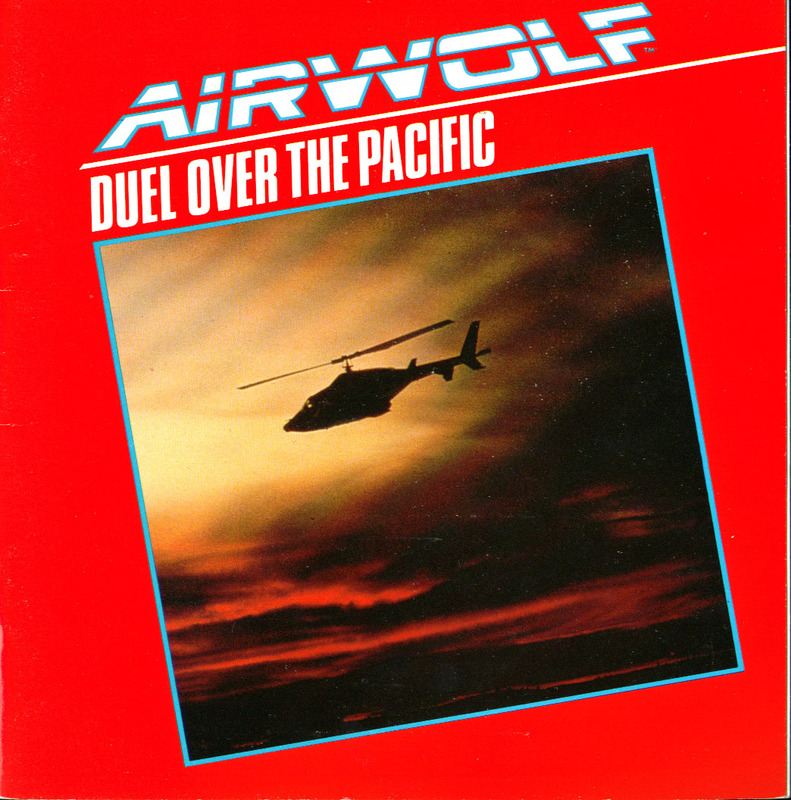 Duel Over The Pacific is one of two Airwolf based audio story books released by Rainbow Communications LTD. 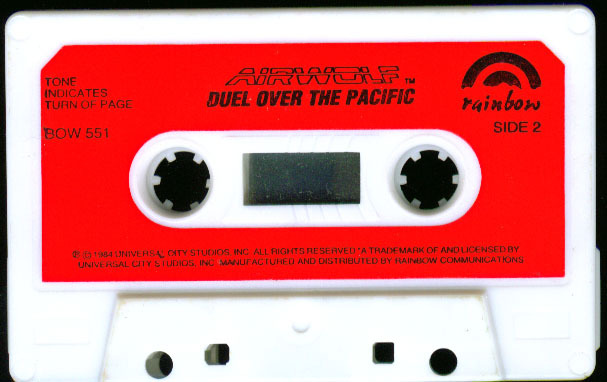 The package consisted of a 25 page story book along with a Cassette Tape. The concept was to listen to the tape while reading the book and a bell would ring to remind you to turn the page. It doesn't contain any Airwolf music or cast from the series. Its a one man show sort of story with alternate vocal tones from one person reading. The story opening comes across like the Pilot Episode "at first" but if you listen to it all.. It's a new story, which means its worth a listen and a read. 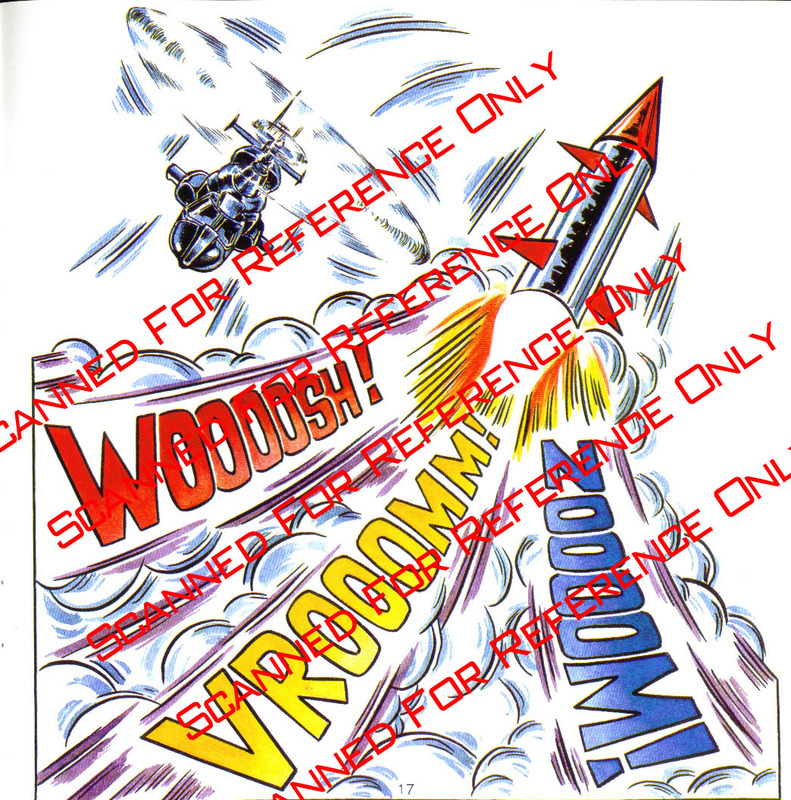 Its a shame it didn't have the original sound effects and music, but funny enough it has a cheep season 4 music flare, like you thought season 4 could be any cheaper lol. 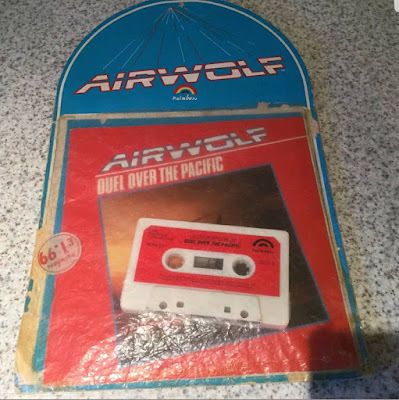 When the theme tune kicks in it also has a feel of the CSI "The Who" opening style, so i guess Airwolf was still ahead of its time when it came to music use within 3rd party multimedia work outside the realms of the music industry. 10 minuets and 22 seconds. 9 minuets and 59 seconds. 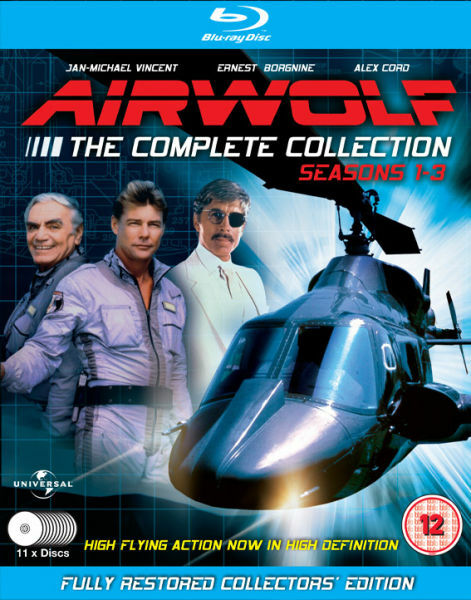 The artwork is not as good as the 1986 Airwolf Annual, but for such a small budget production i think it worked pretty well. 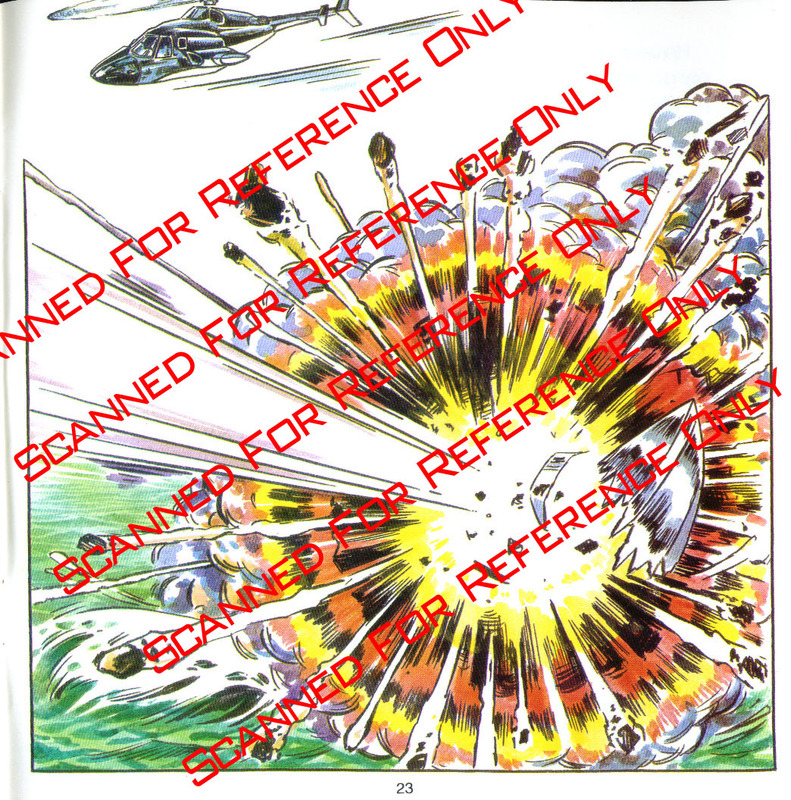 The book features a few of the rare publicity photos that would be thrown around the "Look-In" magazine and Tv Guides back then for show promotion, and also come with some hand drawn art specifically created for the story book. 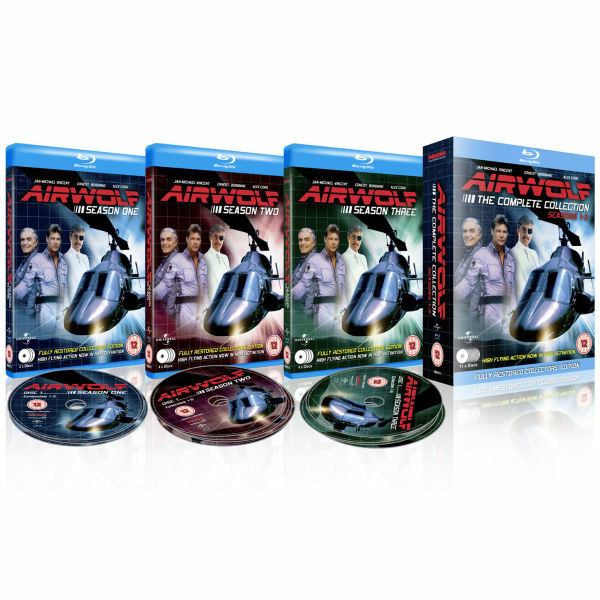 Here it is.. for the first time ever.. Airwolf actually remastered and released on 11 Discs. The vibrant visual is said to blow the Universal Playback dvd releases right out the water. Region B means its a Region 2 UK/European release and not compatible with American B/R machines unless unlocked. Well... what was the cheepest place on Release day? (which is down to Universal OR Fabulous) Not the sellers. 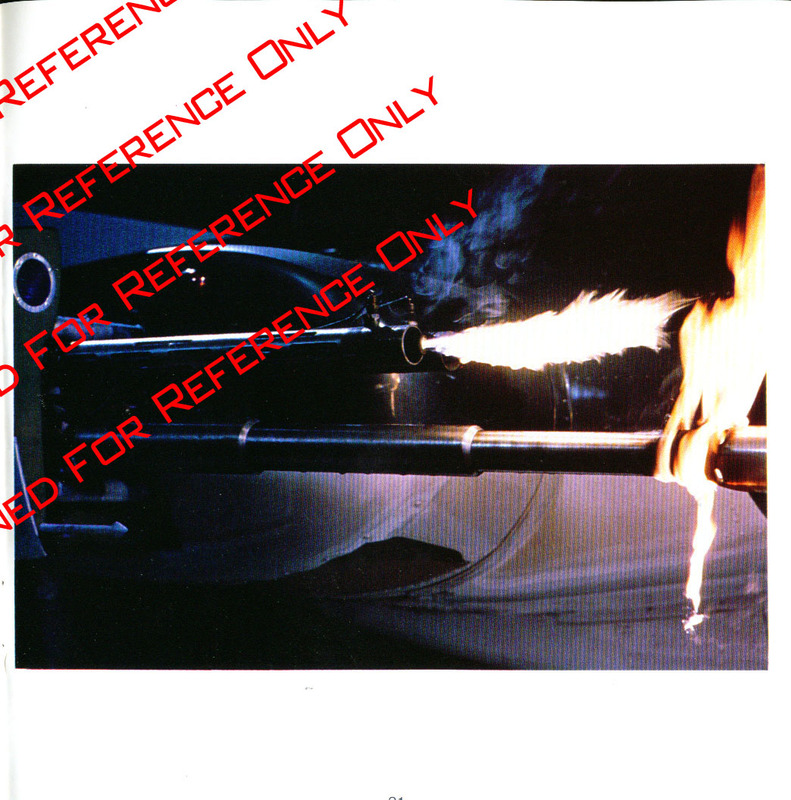 But that doesn't explain why their are scenes "MISSING" For example "Bite Of The Jackal"
18.39 (approx) into the Original Episode & Playback Releases..
Santini Fires a Flare Gun.. then says "I Don't Like The Look Of This"
This set should NOT be confused with the "Universal Playback Release" This New Set Released In April 2014 by Fabulous Films is a Remastered release to accompany the Blu-ray release as shown here. Many thought this "dvd" box front was faked from the blu-ray and was being used to sell pirate versions of the playback release, which in some instances... it was... 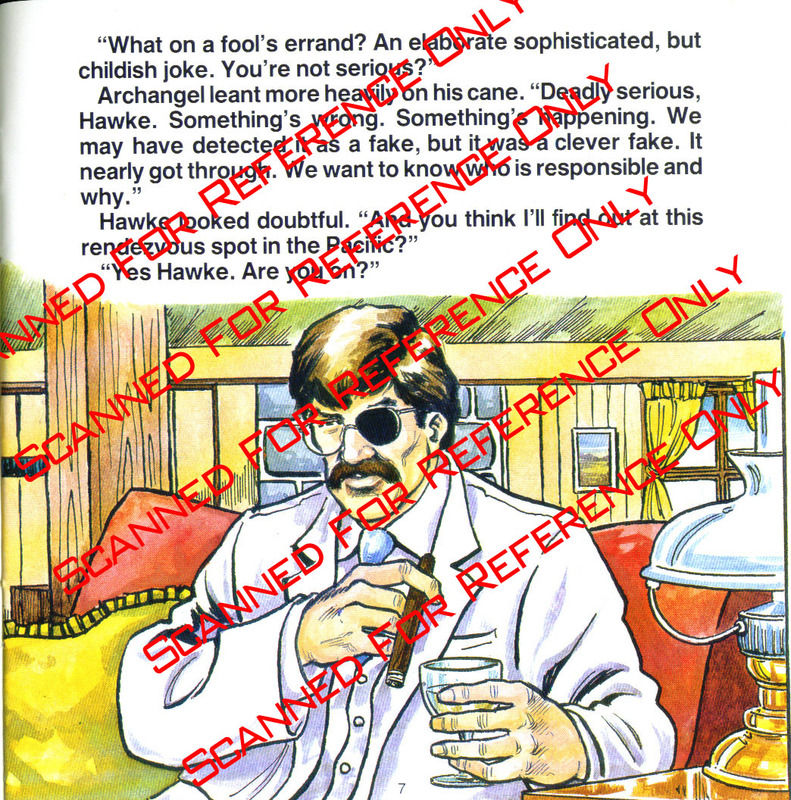 But we can confirm that this remastered dvd set is a genuine product that is available and has its own UPC code. The card sleeve houses 3 pretty proper sturdy DVD boxes and each box also has a booklet, detailing the episodes & cast members. It's a pretty nice looking package first glance. Boxed with a 12 page booklet (6 double sided pages) featuring promo photos along with information about the episode and cast listing. 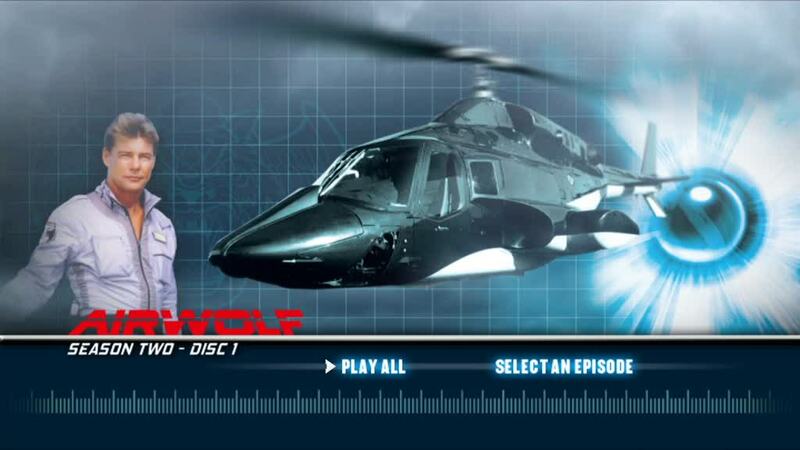 Season 1 comes on 3 duel layer dvd discs that are single sided... so they have artwork on one side. 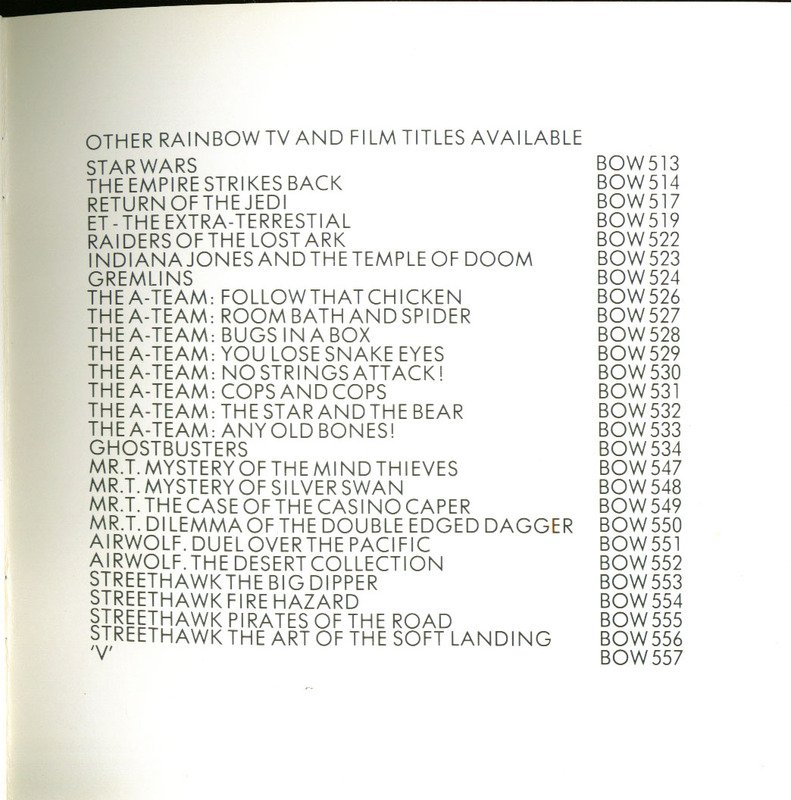 Menu options for disc 1 and 2 consist of "Play All" and "Select Episode"
Disc 3 is the same but also has an "Extras" button. 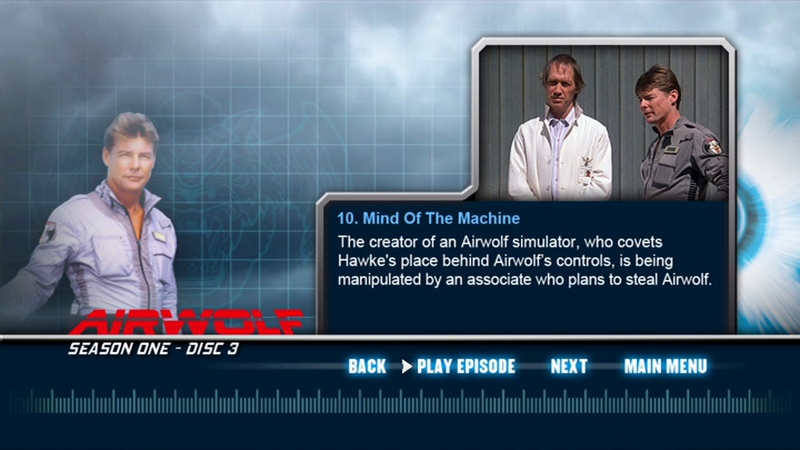 Upon selecting the episodes their is information about the episode and an option to play. 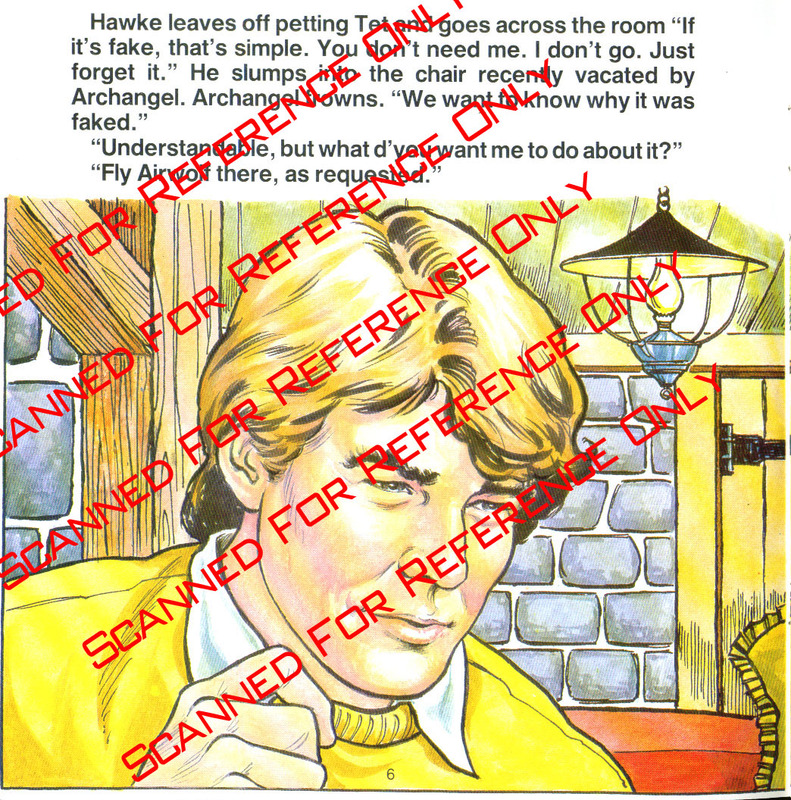 There is no menu for chapters within the episode. 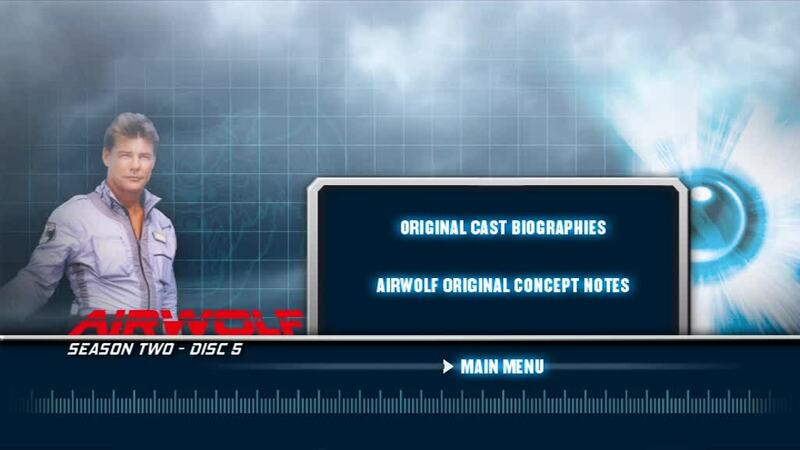 The extras on dvd 3 (season 1) has cast bio screens with some text regarding the person, oddly that list includes Caitlin from season 2 & 3. 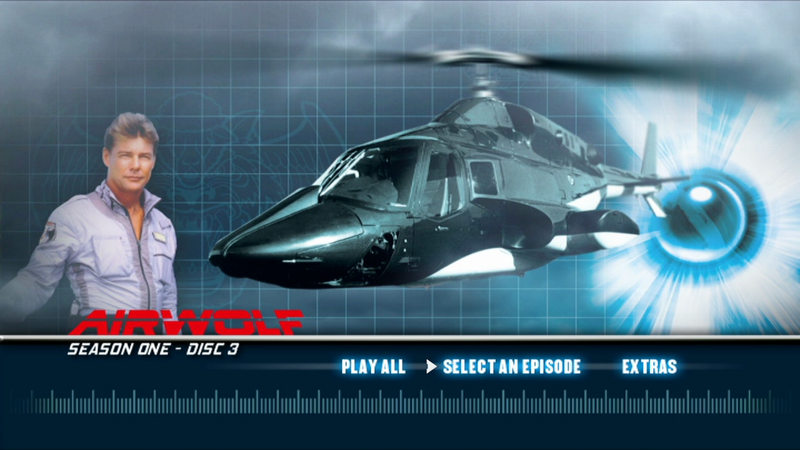 The Main Menu design is semi static and semi animated..
Where i took airwolf through the stargate.. or maybe the gfx editor was a sliders fan lmao. 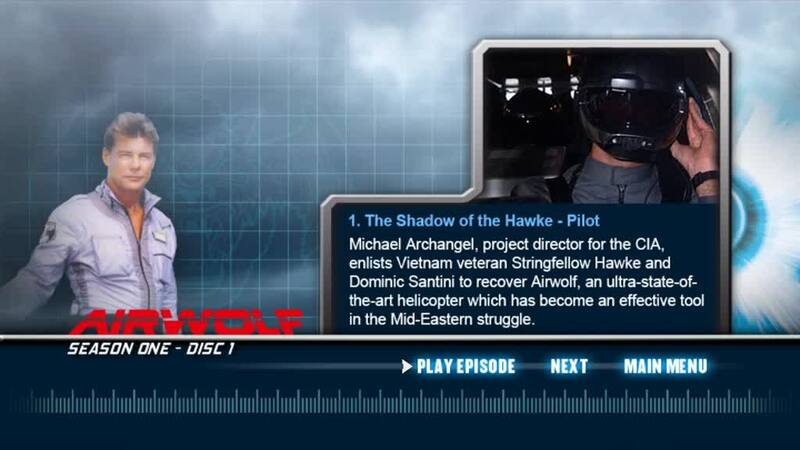 Episode Information screen is pretty nice, although ide of done it like a top secret file (almost like flashpoint briefings on a clip board) with "Top Secret" and "The Firm" and the firms logo, like the dvds are top secret them selves. 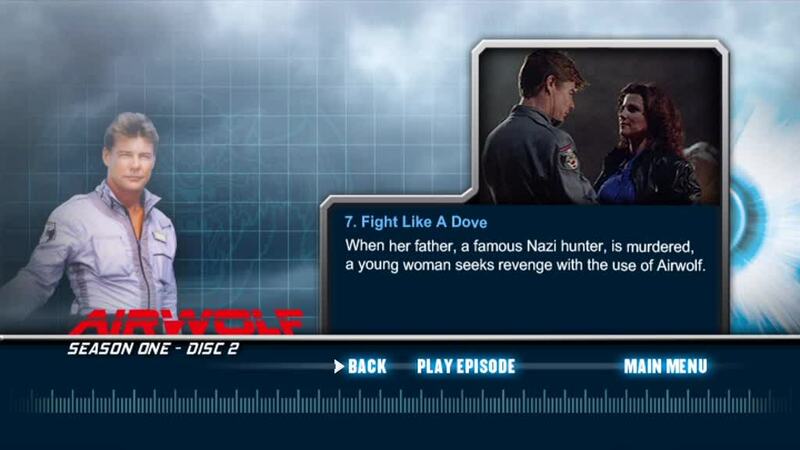 JMV seams to be the featured character on all 3 discs for episode selection. Boxed with a booklet again.. 16 pages (8 double sided pages) featuring episode information and promo photos again. 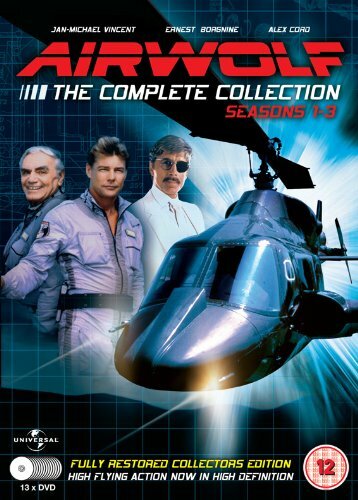 If you own the "Airwolf The Movie" on dvd or blu-ray you will of noticed a lot of the promo shots in these books are included on those disks in their extras menu and one starts to wonder could they not of been linear kinda notes from actual guest stars on the show, mini photo and a few paragraphs of what they thought of the show. Season 2 comes on 5 Discs, Duel Layer Single Sided bearing artwork. Note that all 3 disks (the menu music) is the music used when Driving to the Lair. Ok i guess this is what your waiting for (please note the frames are NOT exact) so please don't assume the remasters have been cropped, you are looking for colour clarity and each image description. Also note that these are shots when VLC Media Player is paused, some do it justice and others do not, depends how vlc is feeling when you pause it & what movement is going on upon the screen as its paused. 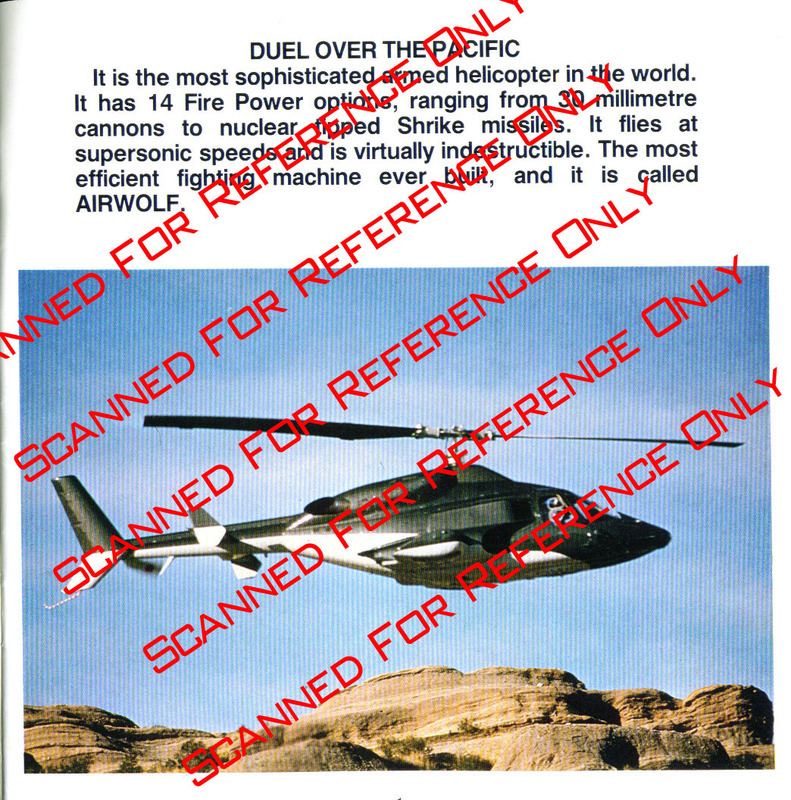 Little note to these Graphic Designers hired to work on Airwolf stuff..
On The LEFT is a Mid Air Refuel Nozzle..
On The RIGHT is a Radio Arial ..
and for that i am eternally grateful.. but one wonders what other scenes are missing!!!! The Issue is as follows.. 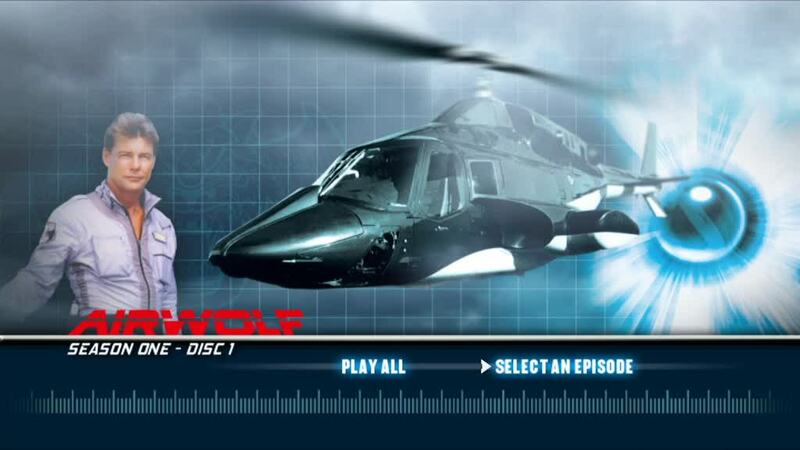 Season 1 Disk 1 Episode "Bite Of The Jackal"
where did it go.. why is it missing.. and begs the question what else have you cut? 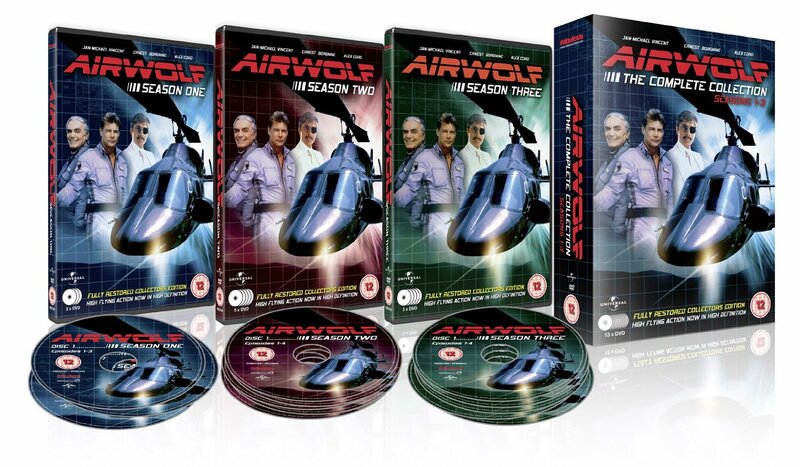 I await your response, as do many fans who read our Airwolf blogs..